One of the reasons we love blogging is being able to share fun new finds, or mom hacks to help you survive...well, motherhood! We love sharing with you guys just as much as we do our close girlfriends. Carrie Beth and I chat all day long about everything, and 99.9% of her mommy maintenance series is something we've chatted about as girlfriends behind the scenes. So when I gave Dove Advanced Care Antiperspirant a try she was the first person I thought of. No, not because she needed it - but because she totally did! Let me backtrack... I was grabbing essentials one day and needed a new deodorant. Mr. Cute was low too, and uses a Dove Men's Antiperspirant - so I grabbed one for me to give a try. 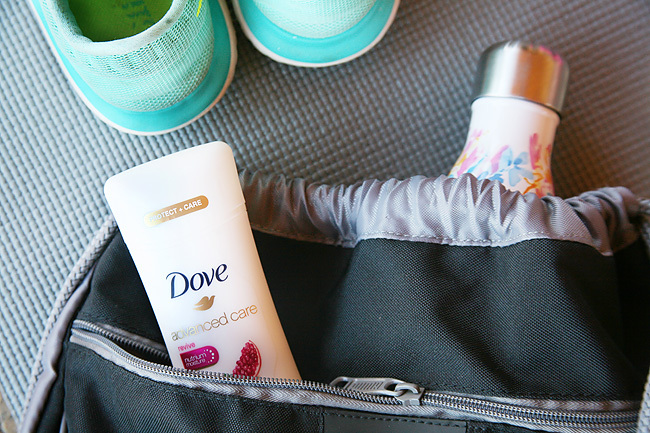 I keep deodorants everywhere - in the bathroom (obviously), in my travel kit, in my gym bag, and even my car. Yes, my car. Because you never know when you might need to smell good. In fact, this has saved me on more than one occasion as a mommy because (1) some days you are just so tired you can't remember if you put some on after your shower, or (2) some days you don't even have time to actually shower. But you get the idea - I like smelling clean. We all do. 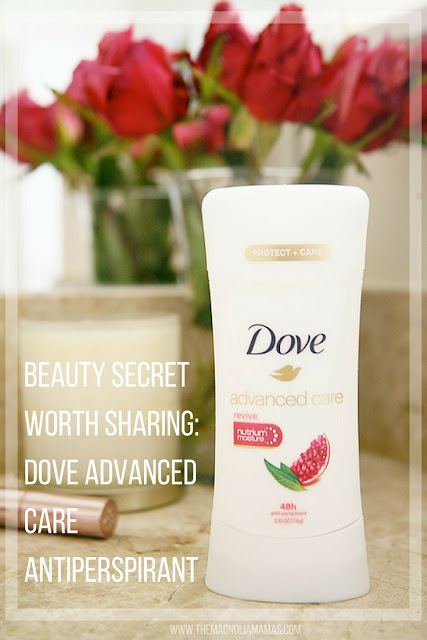 And when I tried Dove Advanced Care Antiperspirant I instantly fell in love. First, it smells amazing! I picked up the Revive scent and it smells kind of fruity with hints of pomegranate and lemon verbena, and lemons always make me think fresh. Second, it feels amazing! With Dove 1/4 moisturizers and NutriumMoisture built in, it makes your skin feel softer and smoother. Throw in up to 48 hours of odor and wetness protection, and a full on love affair has been born. Now this is where Carrie Beth comes in. Last week we met for a fun catch up lunch. It had been forever since we had hung out and since my birthday was in a few days she wanted to bring me my gift. Little did she know I had a gift for her too. When I was purchasing one of my many Dove Advanced Care Deodorants to stash everywhere, I grabbed her one too. Then I shared with her all the ways of why she needed this in her life. Is Jen crazy? Yes - but in a totally good way. ;) But like a good friend, I always listen. 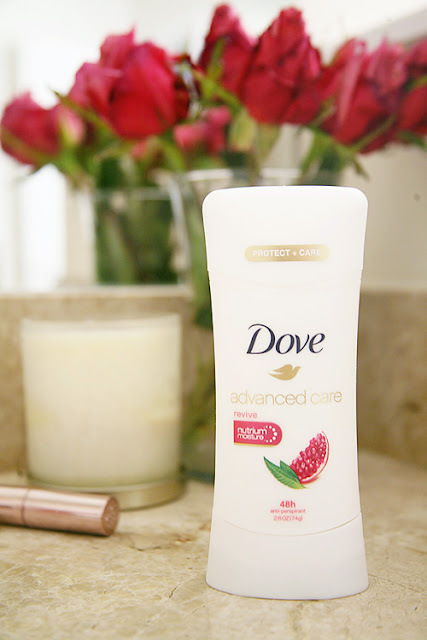 I took my newly gifted Dove Advanced Care Antiperspirant home and gave it a try. Even after only a few uses I knew I loved it just as much as she claimed I would. 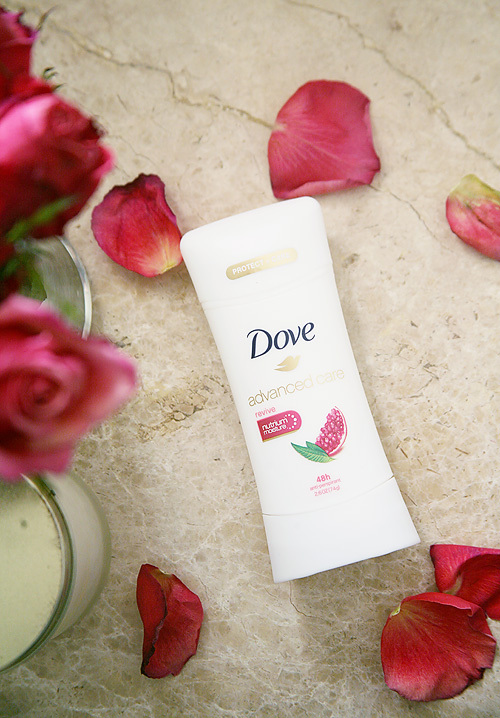 She gave me the Dove Advanced Care Cool Essentials Antiperspirant and it has a lighter, refreshing scent made of cucumber and green tea. It feels so good on my skin, and love the silky smooth moisturizing effect it leaves behind. As a busy mom constantly on the go, feeling great and knowing that I will smell great (even after a gym session when I might not have time to shower post workout) is so reassuring. I am so glad she shared her tip with me! Now just wait until I catch up with my other friends and give them their new Dove Advance Care Antiperspirant presents too. Because sharing is caring, and I love my squad! Give it a try, refer it to your friends too (just maybe not at lunch), and let us know what you think!